DIE Veneris, 8 die Februarii. Message from H. C. with Bills;--and to remind the Lords of the Plague Bill, and the Canary Company Patent. Message from H. C. with the Bill for Discovery of Lives on Estates. Message to H. C. that the Lords have agreed to it; and to return Sir C. Stanley's Bill. Message from H. C. to return Swaffham Churches Bill. Committee to examine the Journal. The Earl of Dorset reported, "That the Committee for Sir Charles Stanley's Bill have considered it, and heard all Parties concerned; and think it fit to pass, with some Alterations." And the Question being put, "Whether to agree to these Amendments made by the Committee?" Hodie 3a vice lecta est Billa, "An Act for settling Lands, for Payment of the Debts of Sir Charles Stanley." 1. To return the Bill for rebuilding the City of London; and do agree with their Lordships in the Amendment and Proviso added. 2. To return the Bill for sowing Hemp and Flax; wherein the Commons have made an Alteration, and desire their Lordships Concurrence therein. 3. To put their Lordships in Mind of the Bill for better ordering those that have the Plague. 4. To put their Lordships in Mind of the Votes of the House of Commons formerly sent up, concerning the Patent granted to the Canary Company. A Message was brought from the House of Commons, by Sir Jonathan Trelawny and others; who returned a Bill for Discovery of the Death of those Persons that have Estates for Lives, and are beyond the Seas, &c.; which Bill they received from their Lordships, and have added Two Provisos, to which they desire their Lordships Concurrence. The said Provisos were read Twice, and Agreed to. The Earl of Dorsett reported, "That the Committee have considered of the Amendments in the Bill concerning the Estate of the Lord Abergaveny; and they think the Bill sit to pass, with those Amendments made by the House of Commons." Which Amendments, being read Twice, were Agreed to by this House. 1. To return them the Bill for settling of Lands, for the Payment of the Debts of Sir Charles Stanley; wherein their Lordships have made some Alterations, and desire the Concurrence of the House of Commons therein. 2. To acquaint them, that this House hath agreed to the Amendments in the Lord Abergavenie's Bill; and also to the Two Provisos in the Bill concerning the Discovery of the Death of Persons beyond the Seas who have Estates for Lives. 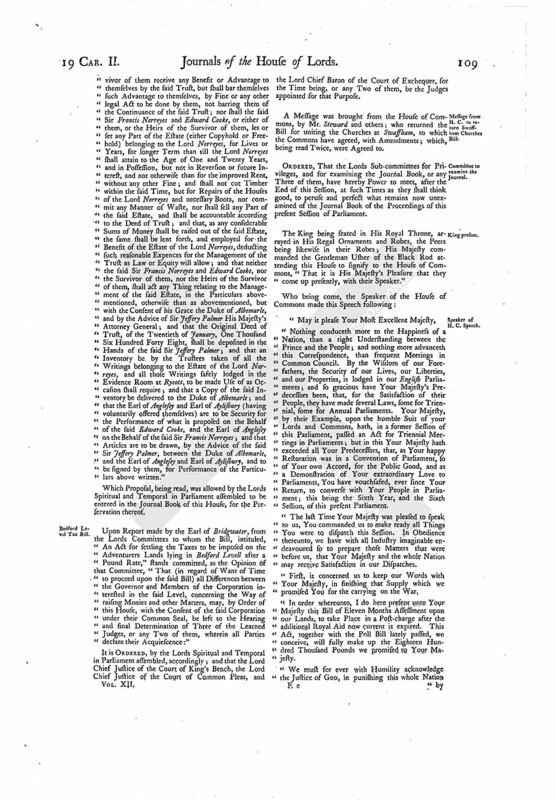 "That, in regard there is not Time to proceed upon the said Bill, it is proposed, That there be no Alteration of the First Trustees, by Addition of any others; and (for the Preservation of the said Estate) it is likewise proposed, That neither the Wife of Sir Francis Norreyes, nor of Edward Cooke Esquire, Trustees for the Estate of the Lord Norreyes, nor the Wife of the Heir of the Survivor of either of them, shall claim any Dower out of the Estate of the Lord Norreyes; nor shall the Heirs of the Survivor of them receive any Benefit or Advantage to themselves by the said Trust, but shall bar themselves such Advantage to themselves, by Fine or any other legal Act to be done by them, not barring them of the Continuance of the said Trust; nor shall the said Sir Francis Norreyes and Edward Cooke, or either of them, or the Heirs of the Survivor of them, let or set any Part of the Estate (either Copyhold or Freehold) belonging to the Lord Norreyes, for Lives or Years, for longer Term than till the Lord Norreyes shall attain to the Age of One and Twenty Years, and in Possession, but not in Reversion or future Interest, and not otherwise than for the improved Rent, without any other Fine; and shall not cut Timber within the said Time, but for Repairs of the Houses of the Lord Norreyes and necessary Boots, nor commit any Manner of Waste, nor shall sell any Part of the said Estate, and shall be accountable according to the Deed of Trust; and that, as any considerable Sums of Money shall be raised out of the said Estate, the same shall be lent forth, and employed for the Benefit of the Estate of the Lord Norreyes, deducting such reasonable Expences for the Management of the Trust as Law or Equity will allow; and that neither the said Sir Francis Norreyes and Edward Cooke, nor the Survivor of them, nor the Heirs of the Survivor of them, shall act any Thing relating to the Management of the said Estate, in the Particulars abovementioned, otherwise than as abovementioned, but with the Consent of his Grace the Duke of Albemarle, and by the Advice of Sir Jeffery Palmer His Majesty's Attorney General; and that the Original Deed of Trust, of the Twentieth of January, One Thousand Six Hundred Forty Eight, shall be deposited in the Hands of the said Sir Jeffery Palmer; and that an Inventory be by the Trustees taken of all the Writings belonging to the Estate of the Lord Norreyes, and all those Writings safely lodged in the Evidence Room at Rycott, to be made Use of as Occasion shall require; and that a Copy of the said Inventory be delivered to the Duke of Albemarle; and that the Earl of Anglesey and Earl of Aylisbury (having voluntarily offered themselves) are to be Security for the Performance of what is proposed on the Behalf of the said Edward Cooke, and the Earl of Anglesey on the Behalf of the said Sir Francis Norreyes; and that Articles are to be drawn, by the Advice of the said Sir Jeffery Palmer, between the Duke of Albemarle, and the Earl of Anglesey and Earl of Aylisbury, and to be signed by them, for Performance of the Particulars above written." Which Proposal, being read, was allowed by the Lords Spiritual and Temporal in Parliament assembled to be entered in the Journal Book of this House, for the Preservation thereof. Upon Report made by the Earl of Bridgwater, from the Lords Committees to whom the Bill, intituled, "An Act for settling the Taxes to be imposed on the Adventurers Lands lying in Bedford Levell after a Pound Rate," stands committed, as the Opinion of that Committee, "That (in regard of Want of Time to proceed upon the said Bill) all Differences between the Governor and Members of the Corporation interested in the said Level, concerning the Way of raising Monies and other Matters, may, by Order of this House, with the Consent of the said Corporation under their Common Seal, be left to the Hearing and final Determination of Three of the Learned Judges, or any Two of them, wherein all Parties declare their Acquiescence:"
It is ORDERED, by the Lords Spiritual and Temporal in Parliament assembled, accordingly; and that the Lord Chief Justice of the Court of King's Bench, the Lord Chief Justice of the Court of Common Pleas, and the Lord Chief Baron of the Court of Exchequer, for the Time being, or any Two of them, be the Judges appointed for that Purpose. A Message was brought from the House of Commons, by Mr. 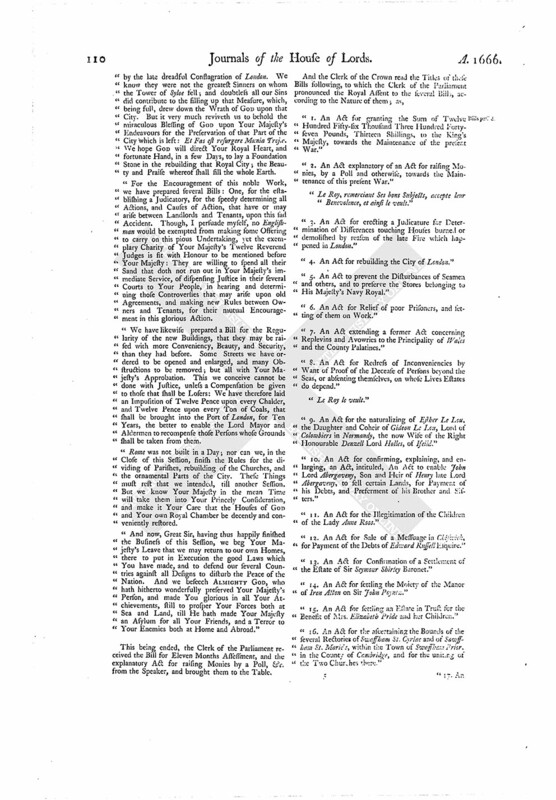 Steward and others; who returned the Bill for uniting the Churches at Swaffham, to which the Commons have agreed, with Amendments; which, being read Twice, were Agreed to. ORDERED, That the Lords Sub-committees for Privileges, and for examining the Journal Book, or any Three of them, have hereby Power to meet, after the End of this Session, at such Times as they shall think good, to peruse and perfect what remains now unexamined of the Journal Book of the Proceedings of this present Session of Parliament. The King being seated in His Royal Throne, arrayed in His Regal Ornaments and Robes, the Peers being likewise in their Robes; His Majesty commanded the Gentleman Usher of the Black Rod attending this House to signify to the House of Commons, "That it is His Majesty's Pleasure that they come up presently, with their Speaker." "Nothing conduceth more to the Happiness of a Nation, than a right Understanding between the Prince and the People; and nothing more advanceth this Correspondence, than frequent Meetings in Common Council. By the Wisdom of our Forefathers, the Security of our Lives, our Liberties, and our Properties, is lodged in our English Parliaments; and so gracious have Your Majesty's Predecessors been, that, for the Satisfaction of their People, they have made several Laws, some for Triennial, some for Annual Parliaments. Your Majesty, by their Example, upon the humble Suit of your Lords and Commons, hath, in a former Session of this Parliament, passed an Act for Triennial Meetings in Parliaments; but in this Your Majesty hath exceeded all Your Predecessors, that, as Your happy Restoration was in a Convention of Parliament, so of Your own Accord, for the Public Good, and as a Demonstration of Your extraordinary Love to Parliaments, You have vouchsafed, ever since Your Return, to converse with Your People in Parliament; this being the Sixth Year, and the Sixth Session, of this present Parliament. "The last Time Your Majesty was pleased to speak to us, You commanded us to make ready all Things You were to dispatch this Session. In Obedience thereunto, we have with all Industry imaginable endeavoured so to prepare those Matters that were before us, that Your Majesty and the whole Nation may receive Satisfaction in our Dispatches. "First, it concerned us to keep our Words with Your Majesty, in finishing that Supply which we promised You for the carrying on the War. "In order whereunto, I do here present unto Your Majesty this Bill of Eleven Months Assessment upon our Lands, to take Place in a Post-charge after the additional Royal Aid now current is expired. This Act, together with the Poll Bill lately passed, we conceive, will fully make up the Eighteen Hundred Thousand Pounds we promised to Your Majesty. "We must for ever with Humility acknowledge the Justice of GOD, in punishing this whole Nation by the late dreadful Conflagration of London. We know they were not the greatest Sinners on whom the Tower of Syloe fell; and doubtless all our Sins did contribute to the filling up that Measure, which, being full, drew down the Wrath of GOD upon that City. But it very much reviveth us to behold the miraculous Blessing of GOD upon Your Majesty's Endeavours for the Preservation of that Part of the City which is left: Et Fas est resurgere Mania Trejæ. We hope GOD will direct Your Royal Heart, and fortunate Hand, in a few Days, to lay a Foundation Stone in the rebuilding that Royal City; the Beauty and Praise whereof shall fill the whole Earth. "For the Encouragement of this noble Work, we have prepared several Bills: One, for the establishing a Judicatory, for the speedy determining all Actions, and Causes of Action, that have or may arise between Landlords and Tenants, upon this sad Accident. Though, I persuade myself, no Englishman would be exempted from making some Offering to carry on this pious Undertaking, yet the exemplary Charity of Your Majesty's Twelve Reverend Judges is fit with Honour to be mentioned before Your Majesty: They are willing to spend all their Sand that doth not run out in Your Majesty's immediate Service, of dispensing Justice in their several Courts to Your People, in hearing and determining those Controversies that may arise upon old Agreements, and making new Rules between Owners and Tenants, for their mutual Encouragement in this glorious Action. "We have likewise prepared a Bill for the Regularity of the new Buildings, that they may be raised with more Conveniency, Beauty, and Security, than they had before. Some Streets we have ordered to be opened and enlarged, and many Obstructions to be removed; but all with Your Majesty's Approbation. This we conceive cannot be done with Justice, unless a Compensation be given to those that shall be Losers: We have therefore laid an Imposition of Twelve Pence upon every Chalder, and Twelve Pence upon every Ton of Coals, that shall be brought into the Port of London, for Ten Years, the better to enable the Lord Mayor and Aldermen to recompense those Persons whose Grounds shall be taken from them. "Rome was not built in a Day; nor can we, in the Close of this Session, finish the Rules for the dividing of Parishes, rebuilding of the Churches, and the ornamental Parts of the City. These Things must rest that we intended, till another Session. But we know Your Majesty in the mean Time will take them into Your Princely Consideration, and make it Your Care that the Houses of GOD and Your own Royal Chamber be decently and conveniently restored. "And now, Great Sir, having thus happily finished the Business of this Session, we beg Your Majesty's Leave that we may return to our own Homes, there to put in Execution the good Laws which You have made, and to defend our several Countries against all Designs to disturb the Peace of the Nation. And we beseech ALMIGHTY GOD, who hath hitherto wonderfully preserved Your Majesty's Person, and made You glorious in all Your Atchievements, still to prosper Your Forces both at Sea and Land, till He hath made Your Majesty an Asylum for all Your Friends, and a Terror to Your Enemies both at Home and Abroad." This being ended, the Clerk of the Parliament received the Bill for Eleven Months Assessment, and the explanatory Act for raising Monies by a Poll, &c. from the Speaker, and brought them to the Table. "1. An Act for granting the Sum of Twelve Hundred Fifty-six Thousand Three Hundred Fortyseven Pounds, Thirteen Shillings, to the King's Majesty, towards the Maintenance of the present War." "2. An Act explanatory of an Act for raising Monies, by a Poll and otherwise, towards the Maintenance of this present War." "3. An Act for erecting a Judicature for Determination of Differences touching Houses burned or demolished by reason of the late Fire which happened in London." "4. An Act for rebuilding the City of London." "5. An Act to prevent the Disturbances of Seamen and others, and to preserve the Stores belonging to His Majesty's Navy Royal." "6. An Act for Relief of poor Prisoners, and setting of them on Work." "7. An Act extending a former Act concerning Replevins and Avowries to the Principality of Wales and the County Palatines." "8. An Act for Redress of Inconveniencies by Want of Proof of the Decease of Persons beyond the Seas, or absenting themselves, on whose Lives Estates do depend." "9. An Act for the naturalizing of Esther Le Lou, the Daughter and Coheir of Gideon Le Lou, Lord of Colombiers in Normandy, the now Wife of the Right Honourable Denzell Lord Holles, of Ifeild." "10. An Act for confirming, explaining, and enlarging, an Act, intituled, An Act to enable John Lord Abergaveny, Son and Heir of Henry late Lord Abergaveny, to sell certain Lands, for Payment of his Debts, and Preferment of his Brother and Sisters." "11. An Act for the Illegitimation of the Children of the Lady Anne Roos." "12. An Act for Sale of a Messuage in Chiswich, for Payment of the Debts of Edward Russell Esquire." "13. An Act for Confirmation of a Settlement of the Estate of Sir Seymour Shirley Baronet." "14. An Act for settling the Moiety of the Manor of Iron Acton on Sir John Poyntz." "15. An Act for settling an Estate in Trust for the Benefit of Mrs. Elizabeth Pride and her Children." "16. 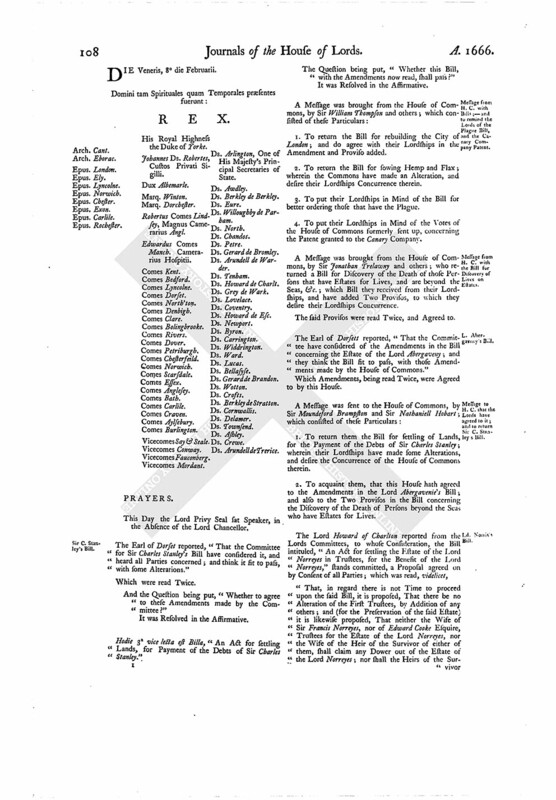 An Act for the ascertaining the Bounds of the several Rectories of Swaffham St. Cyriac and of Sawffham St. Marie's, within the Town of Swaffham Prior, in the County of Cambridge, and for the uniting of the Two Churches there." "17. An Act for the restoring of Francis Scawen Gentleman in Blood." "18. An Act for naturalizing Dame Mary Frazer and others." "19. 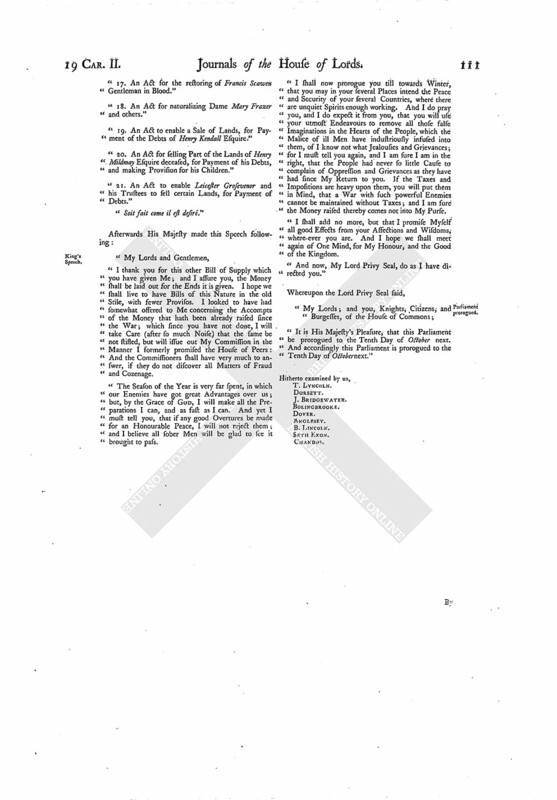 An Act to enable a Sale of Lands, for Payment of the Debts of Henry Kendall Esquire." "20. An Act for selling Part of the Lands of Henry Mildmay Esquire deceased, for Payment of his Debts, and making Provision for his Children." "21. An Act to enable Leicester Grosevenor and his Trustees to sell certain Lands, for Payment of Debts." "I thank you for this other Bill of Supply which you have given Me; and I assure you, the Money shall be laid out for the Ends it is given. I hope we shall live to have Bills of this Nature in the old Stile, with fewer Provisos. I looked to have had somewhat offered to Me concerning the Accompts of the Money that hath been already raised since the War; which since you have not done, I will take Care (after so much Noise) that the same be not stifled, but will issue out My Commission in the Manner I formerly promised the House of Peers: And the Commissioners shall have very much to answer, if they do not discover all Matters of Fraud and Cozenage. "The Season of the Year is very far spent, in which our Enemies have got great Advantages over us; but, by the Grace of GOD, I will make all the Preparations I can, and as fast as I can. And yet I must tell you, that if any good Overtures be made for an Honourable Peace, I will not reject them; and I believe all sober Men will be glad to see it brought to pass. "I shall now prorogue you till towards Winter, that you may in your several Places intend the Peace and Security of your several Countries, where there are unquiet Spirits enough working. And I do pray you, and I do expect it from you, that you will use your utmost Endeavours to remove all those false Imaginations in the Hearts of the People, which the Malice of ill Men have industriously infused into them, of I know not what Jealousies and Grievances; for I must tell you again, and I am sure I am in the right, that the People had never so little Cause to complain of Oppression and Grievances as they have had since My Return to you. If the Taxes and Impositions are heavy upon them, you will put them in Mind, that a War with such powerful Enemies cannot be maintained without Taxes; and I am sure the Money raised thereby comes not into My Purse. "I shall add no more, but that I promise Myself all good Effects from your Affections and Wisdoms, where-ever you are. And I hope we shall meet again of One Mind, for My Honour, and the Good of the Kingdom. "And now, My Lord Privy Seal, do as I have directed you."